Confident and Content - Sugar, Darling? 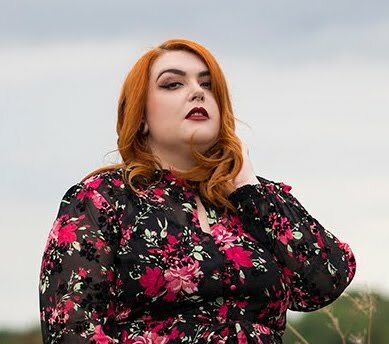 I saw an article recently about the glorious Tess Holliday which was titled 'There Is NOTHING Sexier Than Confidence' and boy do I agree! It got me thinking about how I've felt about my body in the past and how much that has changed over the last year or so, about how other people see me now compared to in my late teens/early twenties and about the pieces of clothing that I love now but would never have dreamed to wear before I realised that life is too short to worry about your dress size. Since I started fashion blogging my confidenced has grown no end and I think that really shows in how I hold myself now. I feel my best when my hair and make up is on point and I'm wearing a great outfit and this naturally makes me feel more confident which shows in my posture, my gate, my expression. There's nothing big headed about it, it just means that I'm extra happy that day and people can sense that when they're around you. This outfit kind of embraces all the body fears I had when I was younger - I'd never get my arms out, I'd never wear long skirts in case I looked dumpy and the thought of showing some tummy would have turned me into a ball of panic. You know what I was then? I was sad. I hated myself. How is it possibly ok to hate yourself and for such a silly reason as what size you are?! You are so much more than your clothes size, you are a unique and wonderful person - there's nobody like you. The path to true happiness starts with learning to love yourself and I really hope if you're not on that path already that you get on there real soon. You deserve a happy life surrounded by loving and supportive people. Your size doesn't make you less deserving of anything. Believe me, learning to love my body and be confident in who I am has made me feel more content and happy than losing weight ever did.